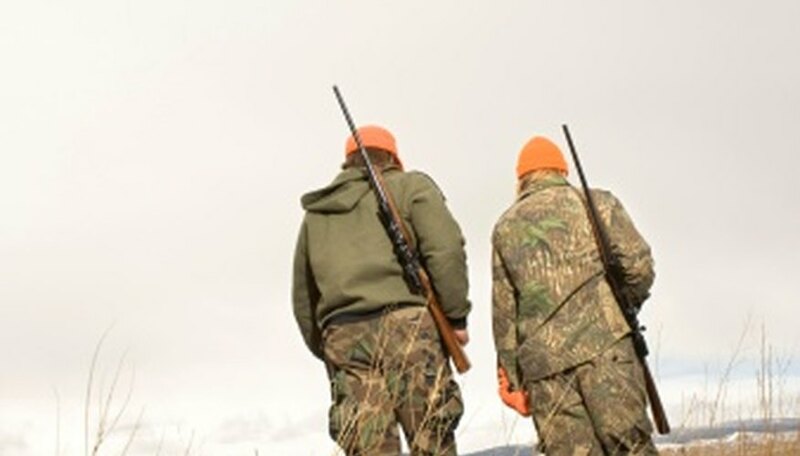 When doing any kind of hunting, outfitting yourself in camouflage is vital to the success of your hunt. In addition to covering your body in camouflage clothes and gear, it is important that you cover your face as well, as dear and other animals can easily spot your bare skin amongst the scenery. Instead of purchasing a pricey camouflage face mask, make your own face mask with inexpensive materials found at your local craft supply store. Use the measuring tape to measure the head you are creating your camouflage face mask for. Two measurements are needed to successfully complete your face mask. First, measure from the base of your neck over the bridge of your nose and down to the base of your neck in the back of your head. This measurement serves as the length of your face mask. Second, measure the circumference of your head, starting at the tip of your nose and wrapping around the side of your head at the ears. This measurement serves as the width of your face mask. Lay out your camouflage fabric and outline the basic shape of your face mask. Measure and mark with your black ink pen a rectangle that fits the dimensions you have just measured. The long sides of the rectangle should be the same length as the first measurement from step 1. The short sides of the rectangle should be half the length of your second measurement from step 1. Mark each of your measurements with the black ink pen, creating a template to follow as you cut out the fabric. Cut out the rectangle template you traced onto your camouflage fabric in step 2. Use the fabric scissors to cut out the template; hold the fabric taught as you cut to prevent creating a jagged edge on your fabric. Begin assembling your face mask. Fold the fabric rectangle in half lengthwise so that the two shorter ends now touch. Pin the side seams in place with sewing pins. Use your sewing machine, loaded with the olive green thread, to sew the side seams shut. Use a zigzag stitch on the most narrow setting to sew the seam. After every two inches of zigzag stitching, set the machine to the back stitch function and back stitch approximately one inch. Back stitching prevents the seam from unraveling when the seam is cut in step 5. Lay the fabric rectangle out flat onto your work surface. Place the fabric beanie hat flat on top of the rectangle. The top of the beanie hat should align with the folded edge of the camouflage fabric. Use the black ink pen to trace the curve of the beanie onto the camouflage fabric. Use the fabric scissors to cut along the curved lines; remove the excess fabric. Use the sewing process from step 4 to sew the seams of the top curve of your mask. Finish the mask by making holes for your eyes, nose and mouth. Place the mask on your head and gentle trace out the location and size of the eyes and mouth. Mark the mask along the bottom of the nose. Use the fabric scissors to cut out the holes for the eyes and mouth and remove the excess fabric. Use the fabric scissors to cut a slit for the nose along the traced line. Use the sewing process from step 4 to finish the edges of each hole. Sew the face mask inside out so that the seams are on the inside of the mask. Use camouflage fabric that coordinates with the rest of your hunting gear to achieve a cohesive look that will better allow you to blend in while hunting.